Spirax-Sarco 2" CI-125 Y-Strainer, flanged ANSI 125, 125lb.steam pressure, cast iron body, 20 mesh stainless steel screens. Spirax-Sarco 2-1/2" CI-125 Y-Strainer, flanged ANSI 125, 125lb.steam pressure, cast iron body, 20 mesh stainless steel screens. Spirax-Sarco 3" CI-125 Y-Strainer, flanged ANSI 125, 125lb.steam pressure, cast iron body, 20 mesh stainless steel screens. Spirax-Sarco 4" CI-125 Y-Strainer, flanged ANSI 125, 125lb.steam pressure, cast iron body, 1/8" perforated stainless steel screens. Spirax-Sarco 5" CI-125 Y-Strainer, flanged ANSI 125, 125lb.steam pressure, cast iron body, 1/8" perforated stainless steel screens. Spirax-Sarco 6" CI-125 Y-Strainer, flanged ANSI 125, 125lb.steam pressure, cast iron body, 1/8" perforated stainless steel screens. Spirax-Sarco 8" CI-125 Y-Strainer, flanged ANSI 125, 125lb.steam pressure, cast iron body, 1/8" perforated stainless steel screens. Spirax-Sarco 1/2" IT Y-Strainer, threaded, 250lb.steam pressure, cast iron body, 20 mesh stainless steel screens. Spirax-Sarco 3/4" IT Y-Strainer, threaded, 250lb.steam pressure, cast iron body, 20 mesh stainless steel screens. Spirax-Sarco 1" IT Y-Strainer, threaded, 250lb.steam pressure, cast iron body, 20 mesh stainless steel screens. Spirax-Sarco 1-1/4" IT Y-Strainer, threaded, 250lb.steam pressure, cast iron body, 20 mesh stainless steel screens. Spirax-Sarco 1-1/2" IT Y-Strainer, threaded, 250lb.steam pressure, cast iron body, 20 mesh stainless steel screens. 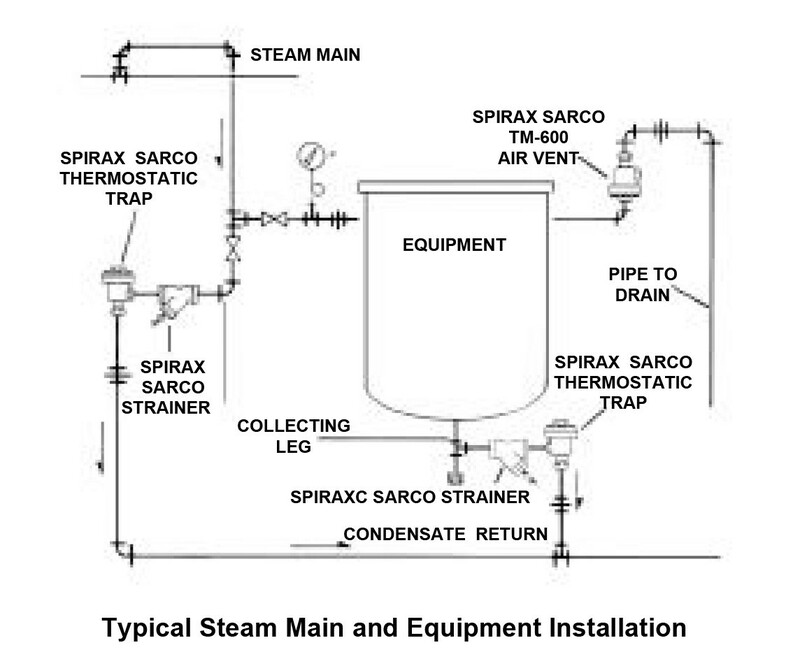 Spirax-Sarco 2" IT Y-Strainer, threaded, 250lb.steam pressure, cast iron body, 20 mesh stainless steel screens. Spirax-Sarco 2-1/2" IT Y-Strainer, threaded, 250lb.steam pressure, cast iron body, 20 mesh stainless steel screens. Spirax-Sarco 3" IT Y-Strainer, threaded, 250lb.steam pressure, cast iron body, 20 mesh stainless steel screens. Spirax-Sarco 2" flanged, 125 psi, Series 733 cast iron basket strainer for steam with a .045 perforated screen. Spirax-Sarco 2-1/2" flanged, 125 psi, Series 733 cast iron basket strainer for steam with a .045 perforated screen. Spirax-Sarco 3" flanged, 125 psi, Series 733 cast iron basket strainer for steam with a .045 perforated screen. Spirax-Sarco 4" flanged, 125 psi, Series 733 cast iron basket strainer for steam with a .045 perforated screen. Spirax-Sarco 6" flanged, 125 psi, Series 733 cast iron basket strainer for steam with a .045 perforated screen. Spirax-Sarco 8" flanged, 125 psi, Series 733 cast iron basket strainer for steam with a .045 perforated screen. Spirax-Sarco 10" flanged, 125 psi, Series 733 cast iron basket strainer for steam with a .125 perforated screen. Spirax-Sarco 12" flanged, 125 psi, Series 733 cast iron basket strainer for steam with a .125 perforated screen. Spirax-Sarco 2" flanged, 250 psi, Series 733 cast iron basket strainer for steam with a .045 perforated screen. Spirax-Sarco 2-1/2" flanged, 250 psi, Series 733 cast iron basket strainer for steam with a .045 perforated screen. Spirax-Sarco 3" flanged, 250 psi, Series 733 cast iron basket strainer for steam with a .045 perforated screen. Spirax-Sarco 4" flanged, 250 psi, Series 733 cast iron basket strainer for steam with a .045 perforated screen. Spirax-Sarco 6" flanged, 250 psi, Series 733 cast iron basket strainer for steam with a .045 perforated screen. Spirax-Sarco 8" flanged, 250 psi, Series 733 cast iron basket strainer for steam with a .045 perforated screen. Spirax-Sarco 10" flanged, 250 psi, Series 733 cast iron basket strainer for steam with a .125 perforated screen. Spirax-Sarco 12" flanged, 250 psi, Series 733 cast iron basket strainer for steam with a .125 perforated screen. Spirax-Sarco model CSF26 culinary steam filter body (element must be ordered separately) with a 1/2" NPT connection. The CSF26 is an in-line all stainless steel filter suitable for use in steam, gas, and liquid systems. It is also USDA approved, and conforms to the requirements of 3-A Accepted Practice Number 609-03 for the production of culinary steam. Spirax-Sarco model CSF26 culinary steam filter body (element must be ordered separately) with a 3/4" NPT connection. The CSF26 is an in-line all stainless steel filter suitable for use in steam, gas, and liquid systems. It is also USDA approved, and conforms to the requirements of 3-A Accepted Practice Number 609-03 for the production of culinary steam. Spirax-Sarco model CSF26 culinary steam filter body (element must be ordered separately) with a 1" NPT connection. The CSF26 is an in-line all stainless steel filter suitable for use in steam, gas, and liquid systems. It is also USDA approved, and conforms to the requirements of 3-A Accepted Practice Number 609-03 for the production of culinary steam. Spirax-Sarco model CSF26 culinary steam filter body (element must be ordered separately) with a 1-1/2" NPT connection. The CSF26 is an in-line all stainless steel filter suitable for use in steam, gas, and liquid systems. It is also USDA approved, and conforms to the requirements of 3-A Accepted Practice Number 609-03 for the production of culinary steam. Spirax-Sarco model CSF26 culinary steam filter body (element must be ordered separately) with a 2" NPT connection. The CSF26 is an in-line all stainless steel filter suitable for use in steam, gas, and liquid systems. It is also USDA approved, and conforms to the requirements of 3-A Accepted Practice Number 609-03 for the production of culinary steam. Spirax-Sarco model CSF26 culinary steam filter body (element must be ordered separately) with a 2-1/2" NPT connection. The CSF26 is an in-line all stainless steel filter suitable for use in steam, gas, and liquid systems. It is also USDA approved, and conforms to the requirements of 3-A Accepted Practice Number 609-03 for the production of culinary steam. Spirax-Sarco model CSF26 culinary steam filter body (element must be ordered separately) with a 3" NPT connection. The CSF26 is an in-line all stainless steel filter suitable for use in steam, gas, and liquid systems. It is also USDA approved, and conforms to the requirements of 3-A Accepted Practice Number 609-03 for the production of culinary steam. Spirax-Sarco model CSF26 culinary steam filter body (two 3" elements must be ordered separately) with a 4" NPT connection. The CSF26 is an in-line all stainless steel filter suitable for use in steam, gas, and liquid systems. It is also USDA approved, and conforms to the requirements of 3-A Accepted Practice Number 609-03 for the production of culinary steam. Spirax-Sarco model CSF26 culinary steam filter body (four 3" elements must be ordered separately) with a 6" NPT connection. 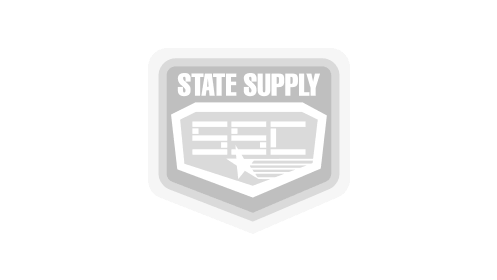 The CSF26 is an in-line all stainless steel filter suitable for use in steam, gas, and liquid systems. It is also USDA approved, and conforms to the requirements of 3-A Accepted Practice Number 609-03 for the production of culinary steam. Spirax-Sarco model BT 3/8" NPT bronze y-strainer for service up to 250 psi and temperatures up to 406°F. This strainer features a 20 mesh screen. 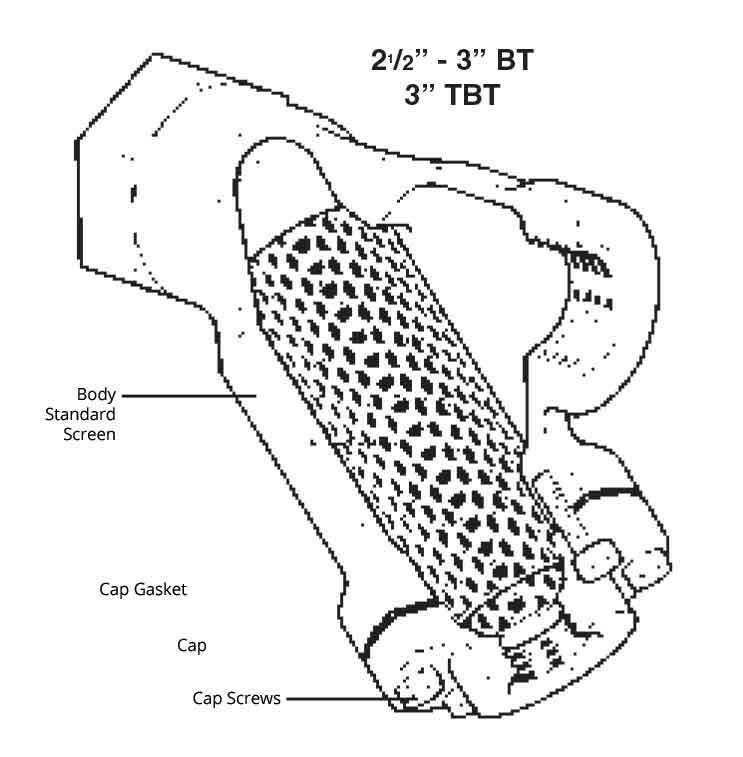 Spirax-Sarco model BT 1/2" NPT bronze y-strainer for service up to 250 psi and temperatures up to 406°F. This strainer features a 20 mesh screen. Spirax-Sarco model BT 3/4" NPT bronze y-strainer for service up to 250 psi and temperatures up to 406°F. This strainer features a 20 mesh screen. 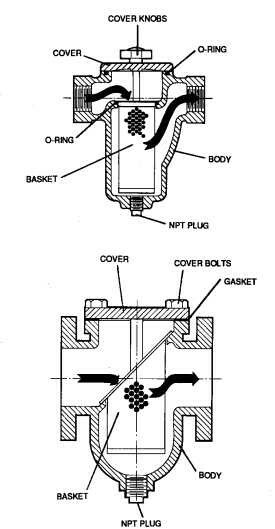 Spirax-Sarco model BT 1" NPT bronze y-strainer for service up to 250 psi and temperatures up to 406°F. This strainer features a 20 mesh screen. Spirax-Sarco model BT 1-1/4" NPT bronze y-strainer for service up to 250 psi and temperatures up to 406°F. This strainer features a 20 mesh screen. Spirax-Sarco model BT 1-1/2" NPT bronze y-strainer for service up to 250 psi and temperatures up to 406°F. This strainer features a 20 mesh screen. Spirax-Sarco model BT 2" NPT bronze y-strainer for service up to 250 psi and temperatures up to 406°F. This strainer features a 20 mesh screen. Spirax-Sarco model BT 2-1/2" NPT bronze y-strainer for service up to 250 psi and temperatures up to 406°F. This strainer features a 20 mesh screen. Spirax-Sarco model BT 3" NPT bronze y-strainer for service up to 250 psi and temperatures up to 406°F. This strainer features a 20 mesh screen. Spirax-Sarco Model CI-250 4" ANSI 250 flanged cast iron y-strainer with a 0.047" perforated stainless steel screen. This strainer's maximum saturated steam pressure is 280 psi.